Don't worry - we've done this once or twice before. At this point, you are working with a member of the POP Yachts sales team to find the perfect vessel for you and your family. Working with the broker that has the largest inventory of any boat broker in the U.S. gives you many choices. For example, we have more secondhand Sea Rays for sale than any dealer or broker in the world (191 at the time of this writing). If we don't have the boat for you, it probably doesn't exist on the market. We have also amassed a database of hundreds of thousands of boats for sale around the U.S. Your salesperson can perform an exhaustive search, which can sometimes take a few days, to let you know what is available. If the boat you want isn't close, don't worry. Transportation is not as expensive as it used to be. Depending on the length of the vessel and whether she is an oversize load, this usually runs between $2.50-$3/mile, insured. If you have found the perfect vessel through another dealer or private seller on a website, it would be prudent to let your salesperson know. Similar to real estate sales, sellers pay the commission on a sale, so it won't cost you anything extra to have us on your side. We bring a lot to the table in these transactions, including an escrow account to ensure money is delivered only after Bill of Sale is signed and delivered, proper negotiating based on our knowledge of the market, USCG documentation and other closing paperwork and tax forms. Plus, you will have someone representing your interests. As a licensed dealer and broker in Florida, we are forced to operate under a strict set of legal guidelines and ethical standards, and it's good to have us on your side during a transaction. What if you don't have the model I am looking for? Just like a real estate agent, we work for you. Let us know what your budget is and a few other parameters that are the most important to you and we will go to work, searching the country for the perfect vessel that suits your needs. You get back to work or back to whatever makes you happy and we will do all the legwork. We're good at our jobs. As a broker, we represent thousands of individual private sellers. While most vessel prices are somewhat negotiable, we cannot guarantee that any offer (other than full price) will be accepted. In general, in today's global market, boats tend to sell at about 93% of their advertised price. There's no way to tell what offer will work for a particular seller unless you try it. We represent you, but we also represent the seller (through a separate individual agent) and therefore have a policy against submitting verbal offers to sellers. We only present offers in writing, backed by a 10% deposit (once accepted by seller). It is only fair to the seller, who may have to talk it over with his wife, or her husband, with their family and perhaps with partners in the vessel or a bank, that the offer be a real offer. Your sales representative can prepare a written offer (Purchase & Sale Agreement, or P & S document). The document we use is endorsed by the Florida Yacht Brokers' Association for consistency. You submit an offer to purchase rather than purchasing outright to give you time to schedule a survey, mechanical inspection, engine compression check and/or trial run. 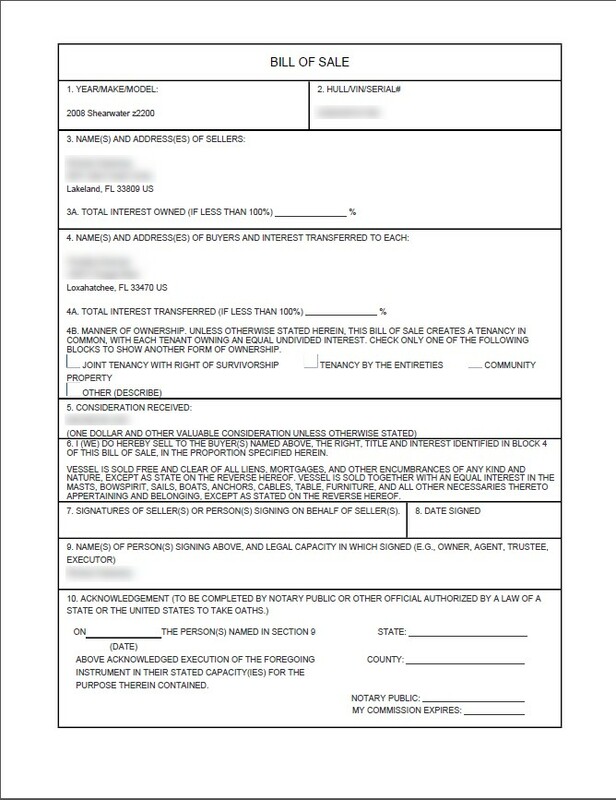 During the window specified in the P & S agreement (typically two weeks), the seller is prohibited from selling this vessel to another party. Without this contract to purchase, the seller could sell the boat to someone else immediately after your successful survey, and you would have paid for a survey and not had the opportunity to purchase! This is a very standard practice, and you would not be able to purchase a used vessel from anywhere else without signing a P & S agreement in advance. Once the P & S agreement is signed by the seller at an agreed upon price, (which could be your initial offer or somewhere in the middle of your offer and the advertised price), you will be assigned a friendly Closing Coordinator whose job it is to ensure your transaction is as smooth as possible no matter what comes up. This closing professional will ask you for a copy of your driver's license, and/or passport as well as your current mailing address. You are required to submit your 10% deposit to our escrow account (see wiring instructions document) within 2 banking (business) days. If not submitted within 2 banking days, the agreement is voided. This deposit can be sent in advance, as many buyers do, and held to use as a deposit once the agreement is signed, or for the deposit on another vessel. At this point, you are free to schedule the survey, inspection and/or trial run. Do I need to back up my offer with a deposit? No, not just yet. While we do ask that all offers be in writing, a deposit is not necessary until the seller agrees to the offer price and terms. This is because the seller could come back to you with a slightly higher counter offer that you may choose to accept. If you had already wired in a 10% deposit, you would now have to wire a few dollars more or your deposit would technically be a little short! We will inform you immediately if the seller accepts your offer and if a deposit is due to bind the contract. Almost all offers contain certain standard conditions (contingencies) that we will include by default. The most common, and included by default, is your right to survey, inspect and/or participate in a trial run. We absolutely recommend you conduct a survey and inspection on any vessel you are looking to purchase. You should know exactly what you are buying and we want you to be happy with your purchase. To maintain our independence and ensure you receive an unbiased report, we cannot select a surveyor for you. We can provide you a list of the three closest accredited surveyors to the vessel or a link to a list of all accredited surveyors in the state. You must select your surveyor on your own, with no feedback or influence from us. Once you have selected a surveyor, simply tell us his/her name and we will coordinate the survey and inspection. Surveys typically run $16/linear foot of the vessel. For example, a survey on a 27' vessel will cost approximately $432. Costs vary depending on the vessel location, distance from selected surveyor, type of vessel and services desired. Some surveyors will also conduct an analysis on the engine(s), including a compression check. Most will not, but will refer you to a marina or other surveyor for that work, if requested. It may take up to 2 days after survey for you to receive your written report from your surveyor. In order to maintain our distance, this report is delivered from the surveyor directly to you (usually by email, as a PDF). It typically includes photos of important areas on the vessel that are discussed. A good surveyor will point out every area that needs any amount of attention. If this is a used boat, you should expect some wear on seats, covers, trailer tires, etc. and it likely won't be perfect. On the survey, keep an eye out for critical items that affect the vessel's condition. Not to worry though, your surveyor will point these out to you, typically using a color-coded or priority-based system for all issues. After reviewing your survey, you need to make a choice. You may reject the vessel because of the survey findings (or for any reason, or no reason) and your deposit will be wired back to your bank, or you may choose to accept the vessel and move forward to funding and purchase. Do I have to do a survey? You never have to do anything! We do suggest a series of steps to ensure you know what you are buying and you are satisfied with your purchase. One of these steps is to hire a local surveyor to conduct a survey. It's a right you have, which is fundamental in our Purchase & Sales agreement and we suggest you exercise it! We can give you the contact information for the closest accredited surveyors in the area but we cannot select a surveyor for you. The ONLY cost to you from POP Yachts is a closing fee of $389. This cost primarily ensures any liens (such as the seller's bank loan) have been paid off and covers the cost and liability of holding deposit and funds in a separate, secure escrow account. Your assigned Closing Coordinator will also handle the coordination of ALL activities from inspection & survey to boat pickup. If you choose to accept the vessel after survey and inspection, we will provide you with a document called an Acceptance of Vessel. It is a 1-page document and will be attached to your previously signed P & S agreement. You should sign it and return it to our Closing Department. 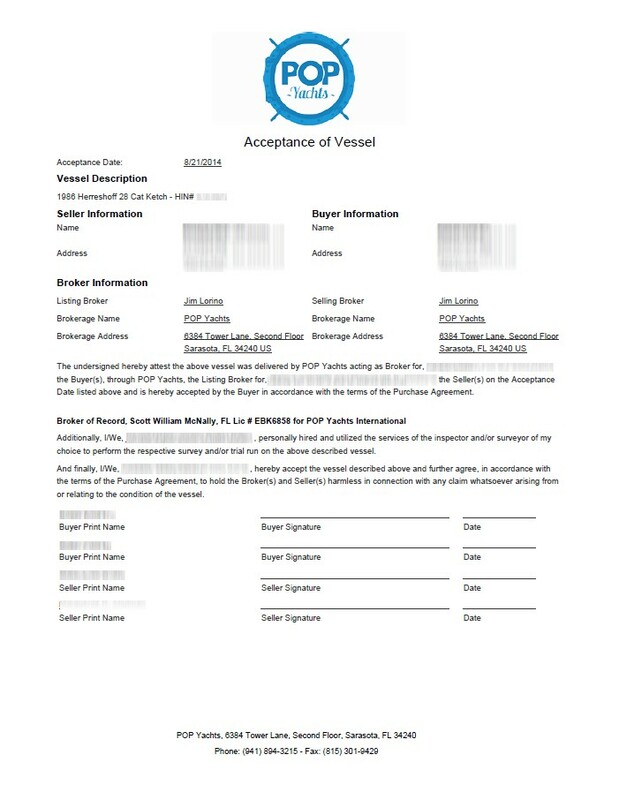 Once we receive a signed Acceptance of Vessel document (also called an AOV), we will prepare the final paperwork and inform you of the final amount due to purchase the vessel (the purchase price minus the 10% deposit), including our closing fee of $389. The closing fee covers all of our wire fees, title and lien searches and any trips to the DMV required to obtain clear title for the Buyer to process, shipping costs for originals and closing paperwork. Remember, you have the right NOT to sign the AOV document. If not signed by the required date in the contract, the vessel is rejected and your deposit will be refunded upon your request. If you need more time, we can quickly put an addendum together signed by yourself and the seller that extends the date for acceptance or closing. What if I want to back out of the purchase? You are always permitted to back out for any reason and have your deposit returned — this is a fundamental right established by our standard Purchase & Sale agreement. After your inspections, survey and/or water trial and once you sign and return this final acceptance document, you must either proceed with the purchase or forfeit your 10% good faith deposit. You can think of this document as the "point of no return" on the purchase. You don't technically have to proceed but you would lose your deposit if you decided not to after signing this acceptance document. Our Closing Department will prepare the Bill of Sale detailing your details and the seller's details, the vessel information and purchase price. The Bill of Sale needs to be signed by both yourself and the seller to be consummated. If at any point, you elect not to proceed to purchase from this point, after signing the Acceptance of Vessel document, your 10% deposit would be forfeited to the seller. Our Closing Department will also prepare a Financial Statement for the transaction for both yourself and the seller. This document explains all funds that have so far been received, and the remaining balance required to complete the purchase. You must sign your Financial Statement and the seller must sign his/hers. 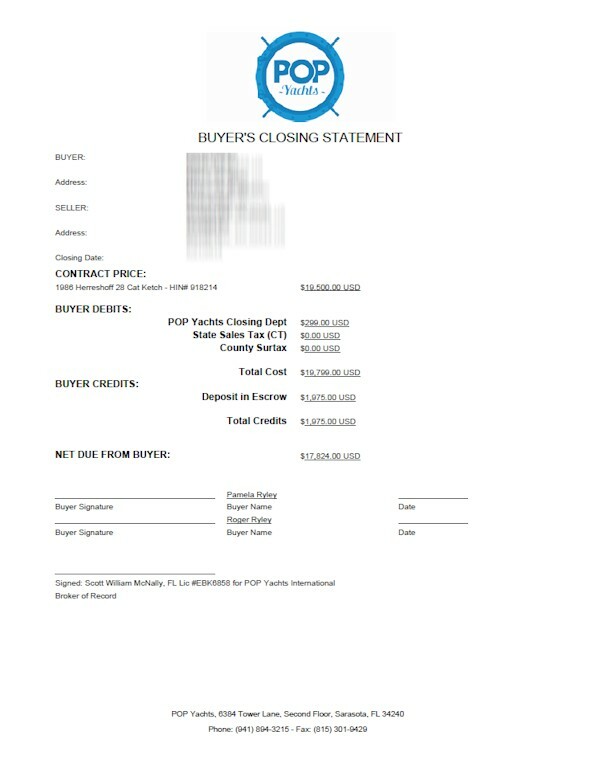 The Buyer's Financial Statement clearly shows the final balance due to complete the purchase. You should wire the balance of the funds to our secure escrow account in the same manner as the deposit was wired. Once the Closing Department is in receipt of all documents and your final funds have cleared (it usually takes less than one business hour for a wire to transfer), we can close the sale and disperse the funds to the seller (and/or the seller's bank if a payoff is necessary to receive the Title). We will ensure the Title (and/or other documents) are assigned to you, the new owner of the vessel, and send you copies of all documents for your records. Do you provide any proof of deposit? Our accounting procedures are second to none. For each deposit into our escrow accounts, we will email you a receipt (as a PDF) recording the amount of funds received and purpose intended for those funds. 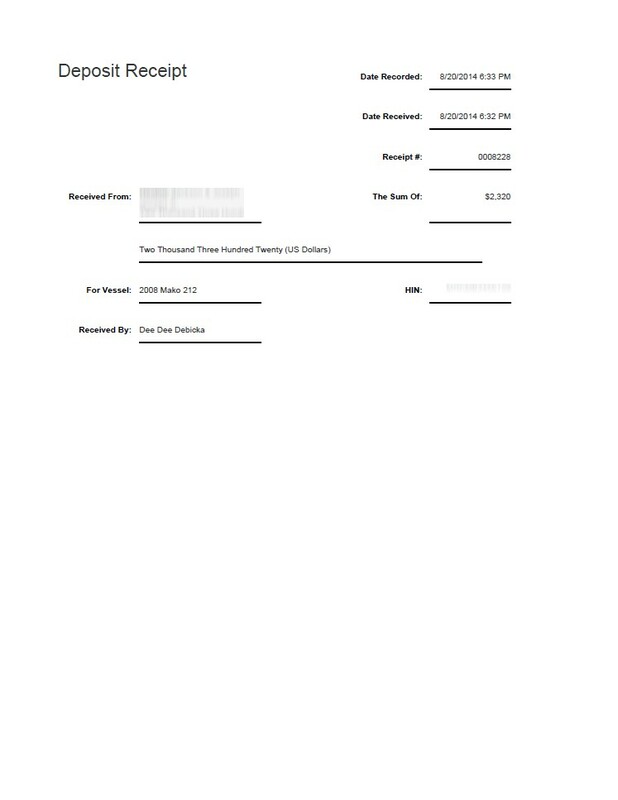 This receipt is proof from us that we are holding these funds for your purchase, to be used only for the purchase of a boat or returned to you, upon your request. As a matter of fact (that we are very proud of), our accounting procedures have been demonstrated to state regulatory authorities, who have heralded these procedures as the most accurate and transparent procedures ever seen in the brokerage industry. Sales tax is due on all boat sales within the State of Florida, if the vessel is located in Florida and staying in Florida. If sales tax is due to be collected, POP Yachts will calculate this tax and it will be included on your Buyer's Financial Statement as part of the final payment due. We will send to the State of Florida on your behalf. As a licensed boat dealer in Florida, we are required to comply with state tax laws. Once the purchase is completed, we will provide you with a Buyer's Tax Statement. To register the vessel in your name, most states will require you to bring the Tax Paid statement, signed Bill of Sale, and signed over Title. All of these documents will be sent to you in your final closing packet which we ship to your address after closing is completed. During the closing process, we will provide you with a completed Florida Tax Affidavit for you to sign. This confirms you will be moving the vessel out of Florida after purchase. With this document signed by you, we are not required to collect Florida Sales Tax. POP Yachts is required to file this paperwork with the State of Florida within 5 days of the closing. For this document to be filed, you will be asked for your Social Security number and driver's license. If you are outside of the U.S., you must send a copy of the identification page in your passport, which will be used to file this document with the State of Florida. Do I have to pay sales tax to you? That depends on which state you are in. In Florida, we are required to collect sales tax on transactions. We send the sales tax to the state on your behalf and supply you with proof that the tax was collected. If you are not in Florida, you'll still have to pay sales tax when you register your boat for use in your state — but we won't collect it directly. You are now the friend with a boat! Our Closing Department is already working on everything you need after the sale. At this point, you have completed the closing process from start to finish. We are the largest broker in the U.S. for a very good reason: We take pride in our work and we always take care of the parties we represent. Do I just go pick it up? Yes! No one is going to stop you. How you pick it up or move the boat is up to you. If you don't wish to do it yourself, you can contact a ground shipper who will come pick up the boat for you and deliver it to your home or home marina. However, if you are taking the boat out of Florida, you need to do so in the next 30 days. You usually have 30 days in your home state to register your new vessel. If you are ready to dive in, browse our listings. However, if you have any questions about the buying process, or you aren't sure where to start, click Contact Us and fill out the form. An experienced member of our team will be in touch.